Oncolite is a limestone made of oncoids, the roundish, tan things in the picture (average size less than an inch). Oncoids are made by microbes called cyanobacteria. Cyanobacteria, which also form larger mounds called stromatolites, are thought by many scientists to be one of the earliest forms of life to evolve on Earth. 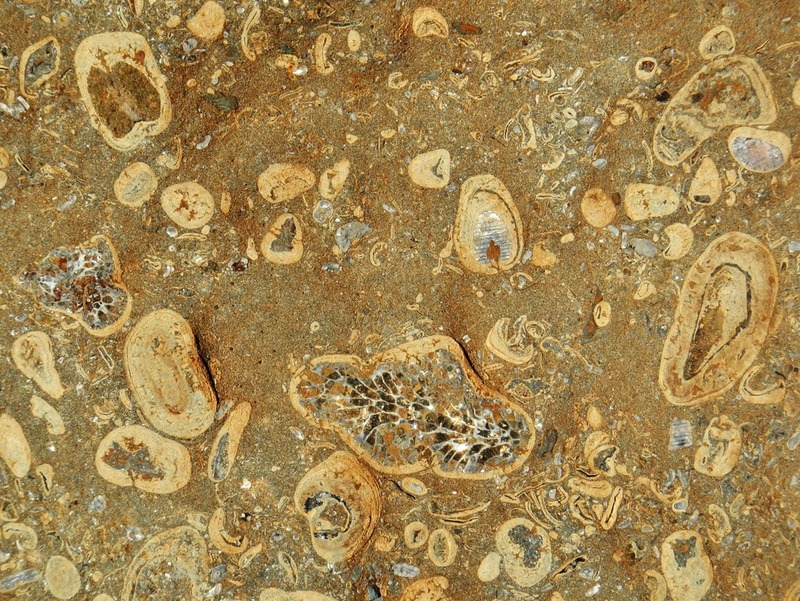 The microbes attach to a nucleus – in this case fossil fragments – and encrust it in layers of calcium carbonate. The bacteria gather energy by photosynthesis and, thus, require access to the sun. 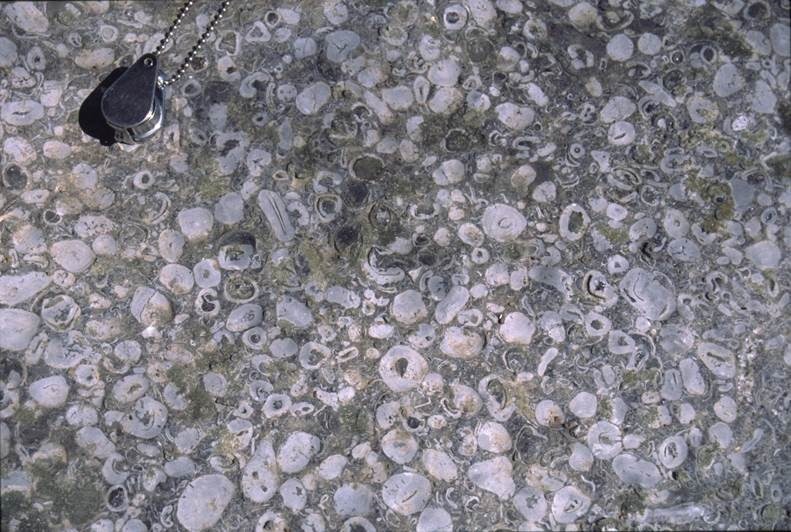 Because they are easy to recognize and mostly limited to shallow marine environments, oncolites are useful to geologists, both as a stratigraphic marker and as an indicator of the depositional environment of the rock they are preserved in. 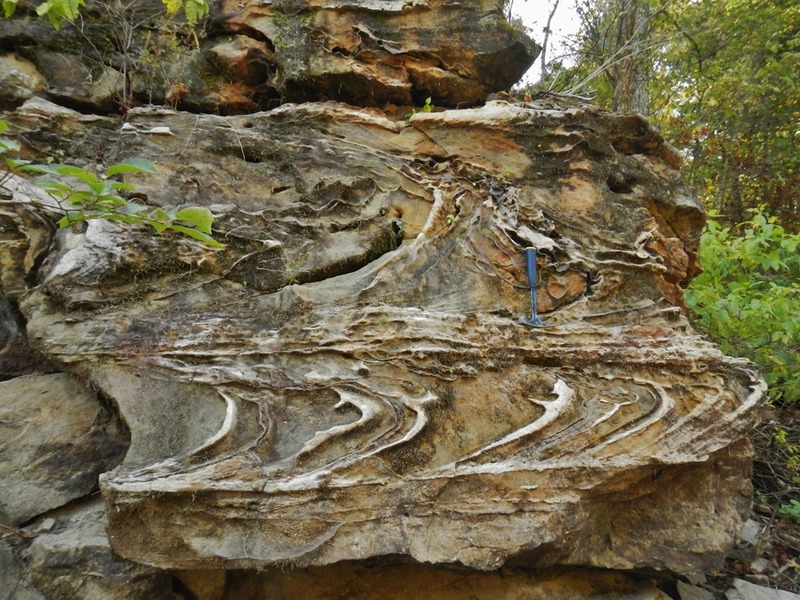 These were photographed in the Kessler Limestone Member of the Bloyd Formation, northwest Arkansas. 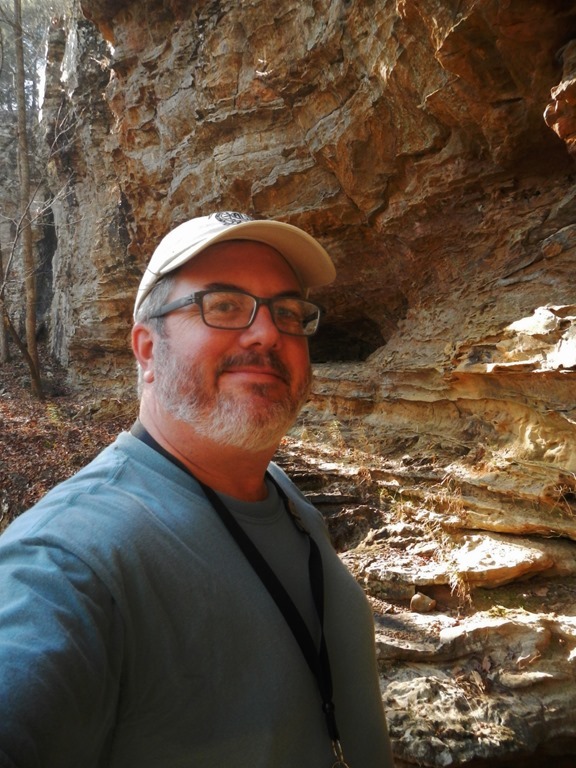 This entry was posted in #geoblog, GeoPic of the Week and tagged Arkansas, cyanobacteria, Fossil, Geology, oncoid, oncolite, sedimentary rock, stromatolites on October 3, 2017 by argeology. 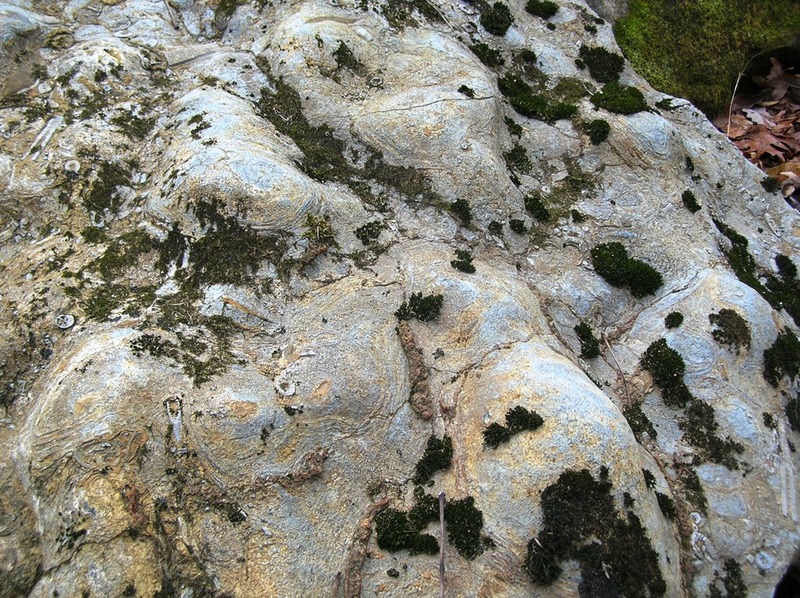 One of the most fossiliferous formations in the state is the Pitkin Limestone. 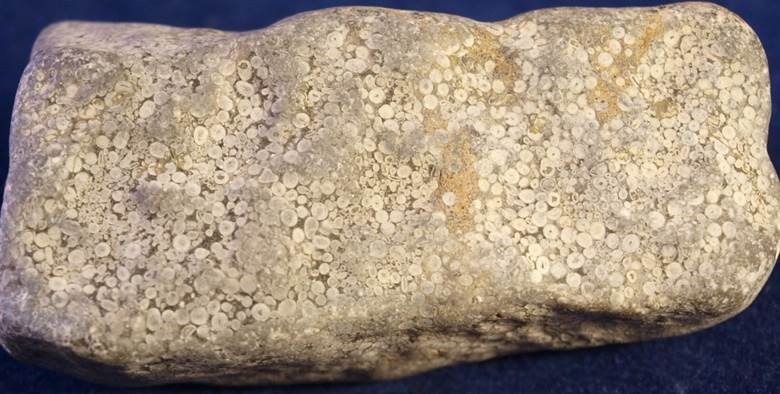 It was referred to as the Archimedes Limestone in the late 1890s because it contains an abundance of the screw-shaped bryozoan fossil Archimedes. It was formally named the Pitkin Limestone in 1904 for exposures near Pitkin Post Office in Washington County, Arkansas. If you can’t find the town of Pitkin on a map, don’t worry–it’s now known as Woolsey. The Pitkin began as carbonate sediments deposited in the Mississippian Period around 320 million years ago. At that time, northern Arkansas was covered by a shallow sea that was fairly close to the equator. Warm, shallow seawater is a prime environment for the build-up of carbonates. 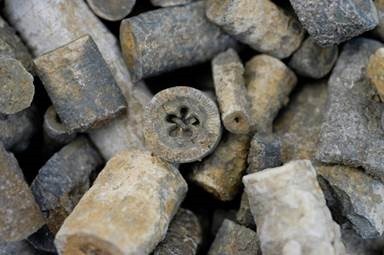 Marine organisms extracted calcium carbonate out of the seawater to form shells or other hard parts. This material accumulated and eventually turned into limestone. Some of those secreted structures are preserved as fossils in the rock and are clues to the environmental conditions that existed at the time. 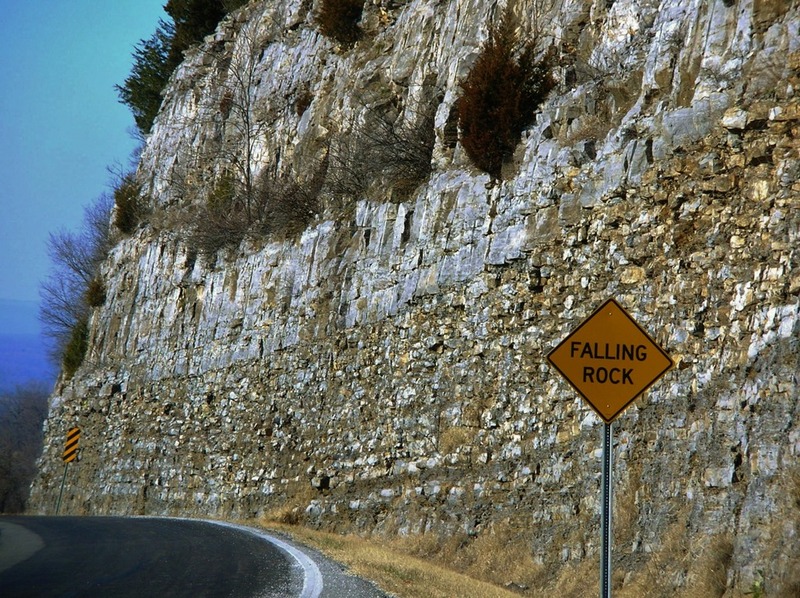 The Pitkin Limestone is a bluff-former that crops out in the southern portion of the Ozark Plateaus from just south of Fayetteville eastward to Batesville, typically along the Boston Mountains Plateau Escarpment. It is mostly limestone, however, there is some nodular black chert present locally. Black shale intervals are common in the eastern portion. 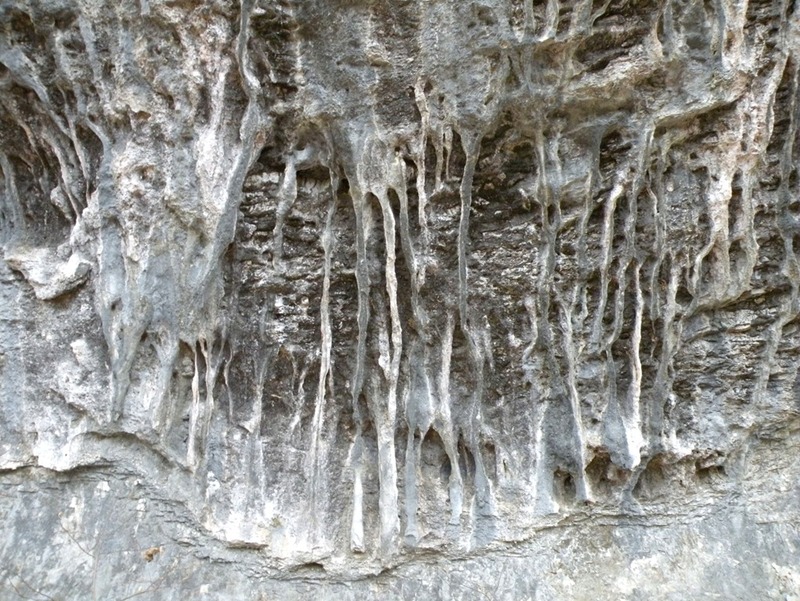 Because limestone is a soluble rock, karst features such as caves, sinkholes, springs, and disappearing streams are common in this Formation. 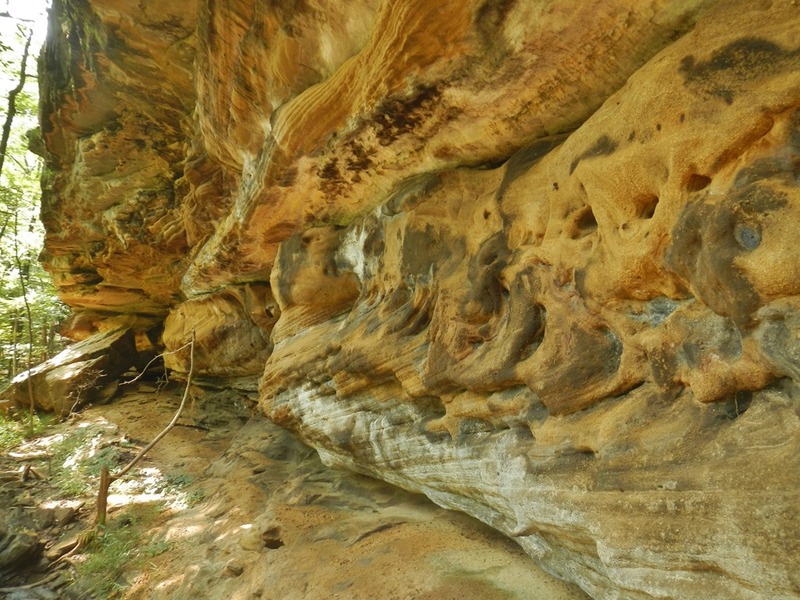 About 9% of the known caves in Arkansas are in the Pitkin. Its thickness varies from an average of about 50 feet on the west side of the state to about 200 feet in the eastern part with a maximum of about 400 feet in the central portion. It typically rests on the Fayetteville Shale and is overlain by the Cane Hill Member of the Hale Formation in western Arkansas and by the Imo interval from the area of western Searcy County eastward. 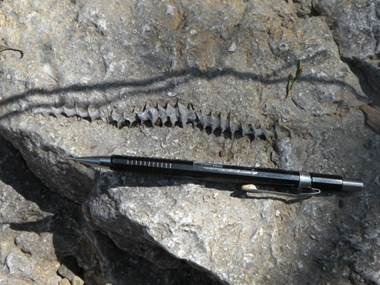 Now, let’s look at fossils commonly found in the Pitkin. The photos above contain fossils of Archimedes. 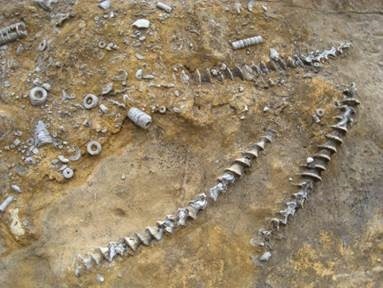 The fossil is named for the ancient Greek engineer who invented a device that incorporated a large screw to lift water for irrigation. The left photo was taken south of Batesville and the right photo was taken south of Fayetteville. It’s remarkable that these fossils are so persistent along this great extent. 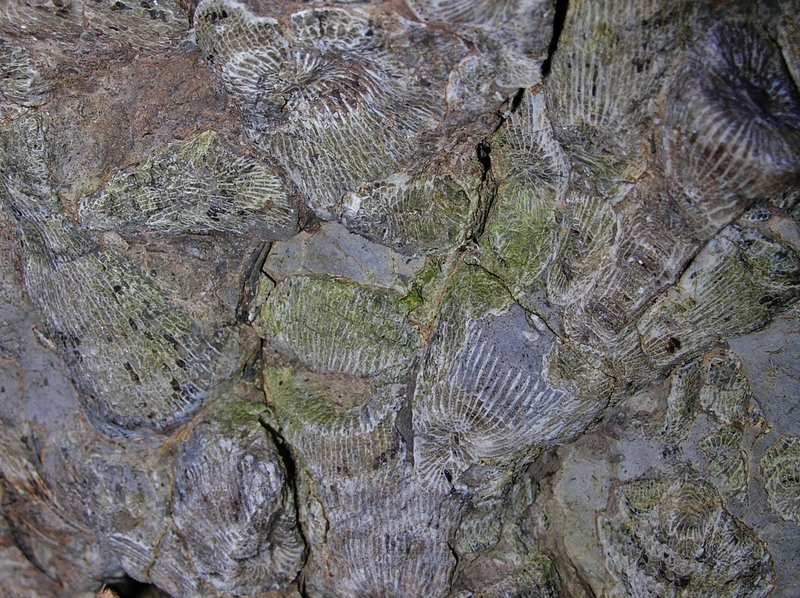 Although this fossil is characteristic of the Pitkin, it can also be present in adjacent formations. The illustration below is a sketch of a fenestrate Bryzoan of which Archimedes is a type. 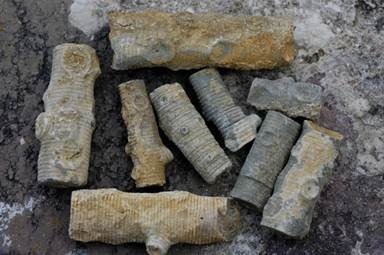 Pieces of fossilized Crinoids are also abundant in the Pitkin. Most commonly, small button-shaped pieces of the stem and arms, known as columnals, are preserved in the limestone. That is a columnal in the center of the left photo. The larger crinoid fossils above were preserved in shale and were most probably washed onto a mud flat during a storm event. These photos were taken south of Batesville, but crinoid detritus is abundant throughout the Pitkin and most other limestone in Arkansas. A great location to see the Pitkin is along Richland Creek at its confluence with Falling Water Creek. 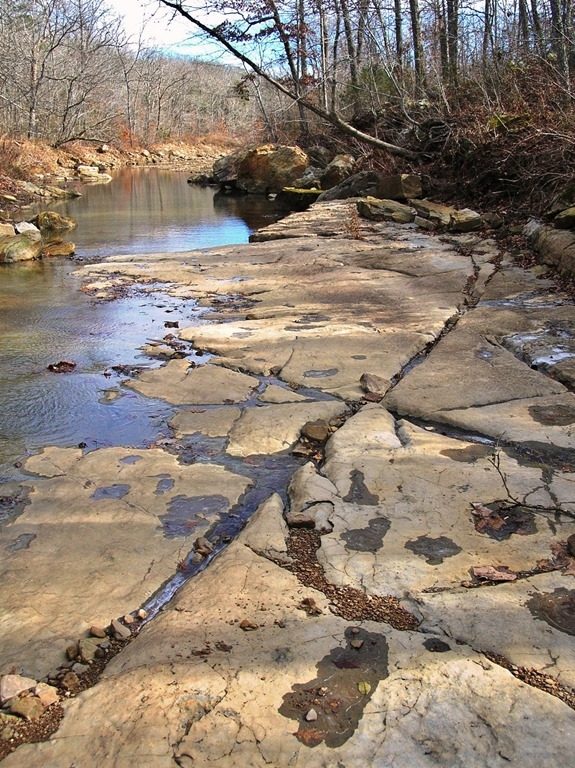 When the creek level is low, you can hike upstream from the campground and see many fine exposures of Pitkin Limestone in the creekbed. Locally, colonies of tabulate and rugose coral were preserved in the Pitkin and can be discovered upon close inspection of the outcrop. Tabulate or colonial coral in the Pitkin Limestone along Richland Creek. Locally, the Pitkin consists of oolite, a type of sedimentary rock composed of ooliths. 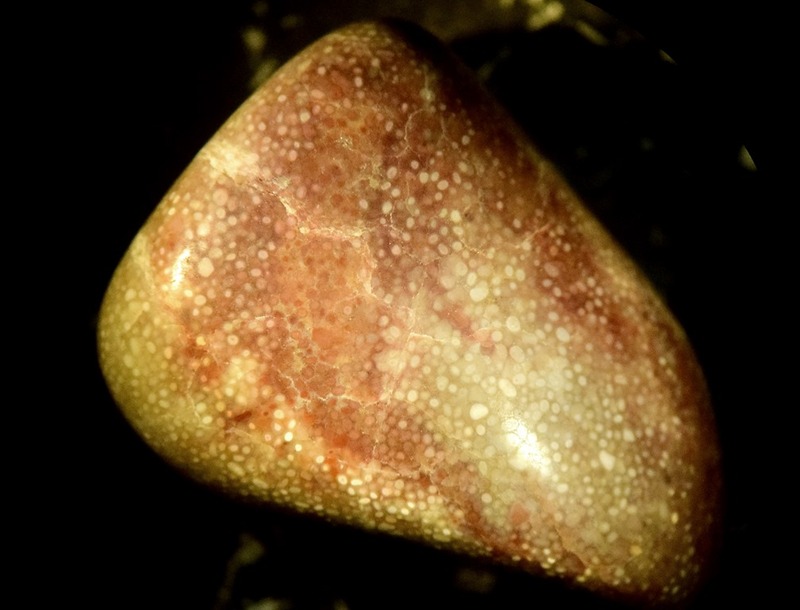 Ooliths are small, spherical structures (<2 mm) that form by accretion of numerous concentric layers of calcite on a central nucleus such as a shell fragment or sand grain. The environment of deposition would have been areas where strong bottom currents or wave action rolled the fragment around in carbonate-rich sea water. This would include environments like beaches and tidal flats. Oncolites and stromatolites are also preserved in the Pitkin. They have a similar structure to ooliths, but are much larger (up to 10 cm), can be round or irregular-shaped, and are formed by a different mechanism. 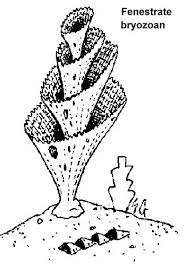 Like ooliths, they nucleate on a shell or other fragment, but are built up by encrusting layers of blue-green algae or cyanobacteria. Stromatolites form in much the same way, but create columns, mats, or large heads. Stromatolites and oncolites typically indicate a paleoenvironment of warm, shallow water in a calm sea, lagoon, or bay. 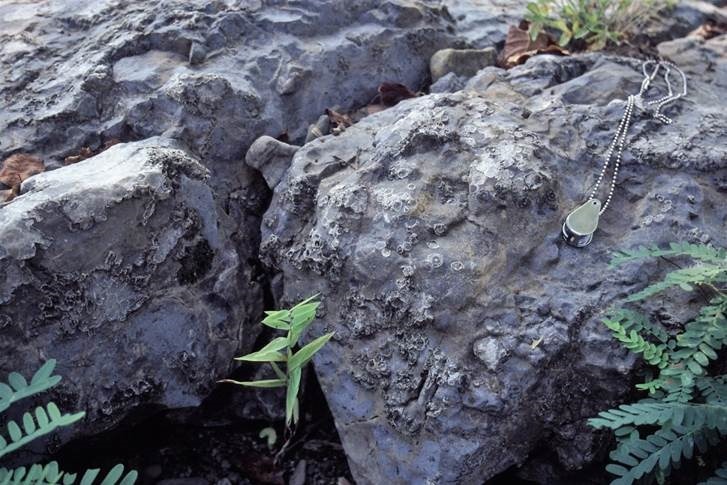 During fieldwork for our geologic mapping, finding Pitkin Limestone is always exciting because there is something new and interesting to discover every time. 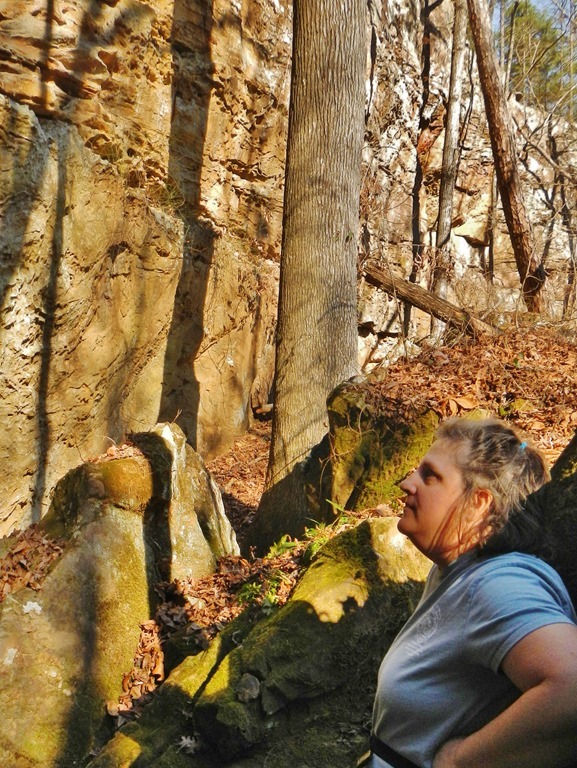 We hope this brief introduction to one of Arkansas’ most intriguing formations has convinced you to seek out the Pitkin and have a closer look. Until next time, we’ll see you on the outcrop! This entry was posted in Notes From The Field and tagged Archimedes, Arkansas, Cane Hill, Crinoids, Fayetteville Shale, fossils, Imo, karst features, limestone, Mississippian, oncolites, ooliths, Ozark Mountains, Ozark Plateaus, Pitkin Limestone, Richland Creek, sedimentary rock, sedimentary structure, stromatolites on December 16, 2016 by argeology. Well, another year, another map! The Brownsville quad is now published (see map below), and a link to it will be posted on our website soon. 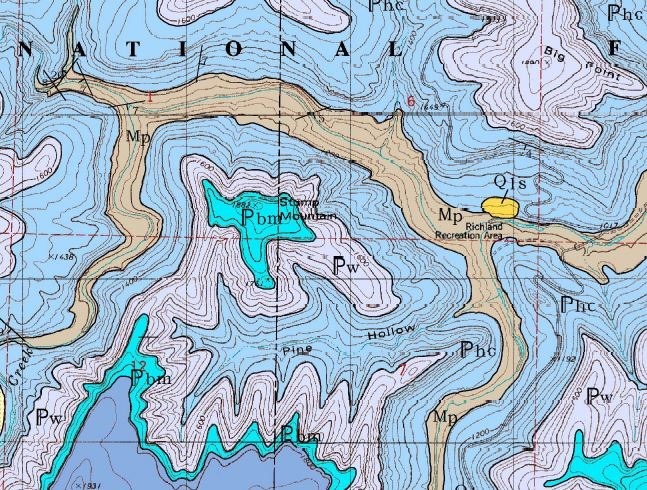 This year marks the 22nd anniversary of Statemap, aka the National Cooperative Geologic Mapping Program, in Arkansas. Statemap is partially funded by a USGS grant, and was established to encourage the states to map their surface geology at the 1:24,000 scale. 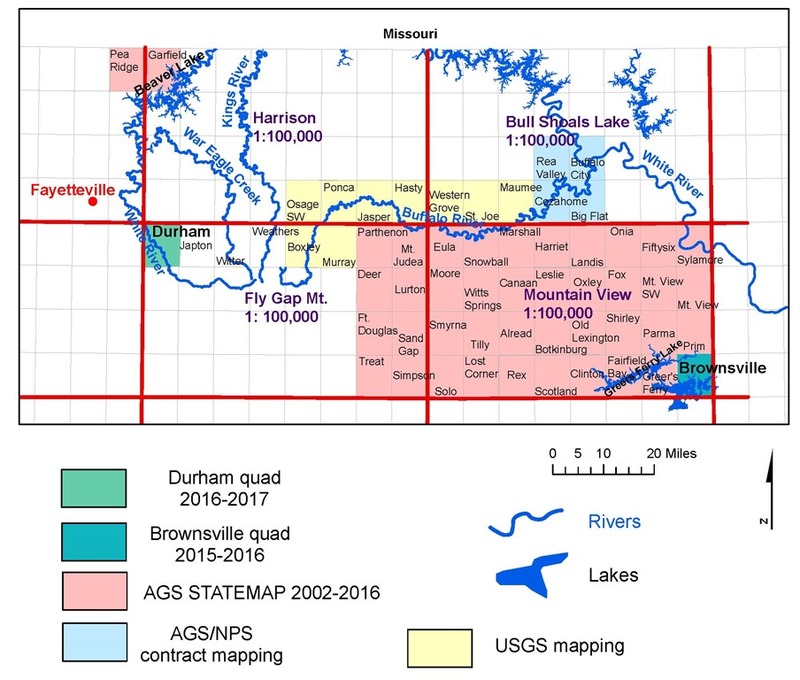 To date, our mapping teams have completed thirty-three quadrangles in the West Gulf Coastal Plain and, with the recent publication of the Brownsville quad, forty quads in the Ozark Plateaus. 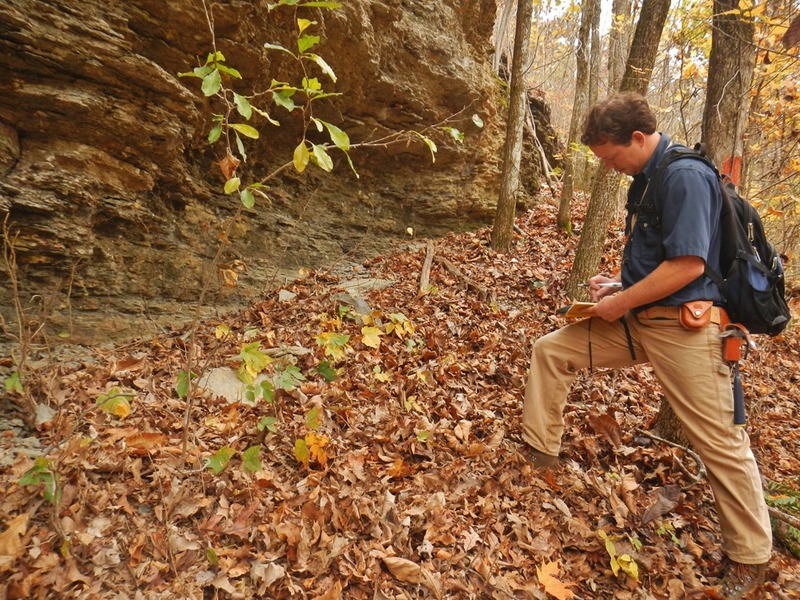 The geology of the area around Greers Ferry Lake has never been mapped in great detail until now. 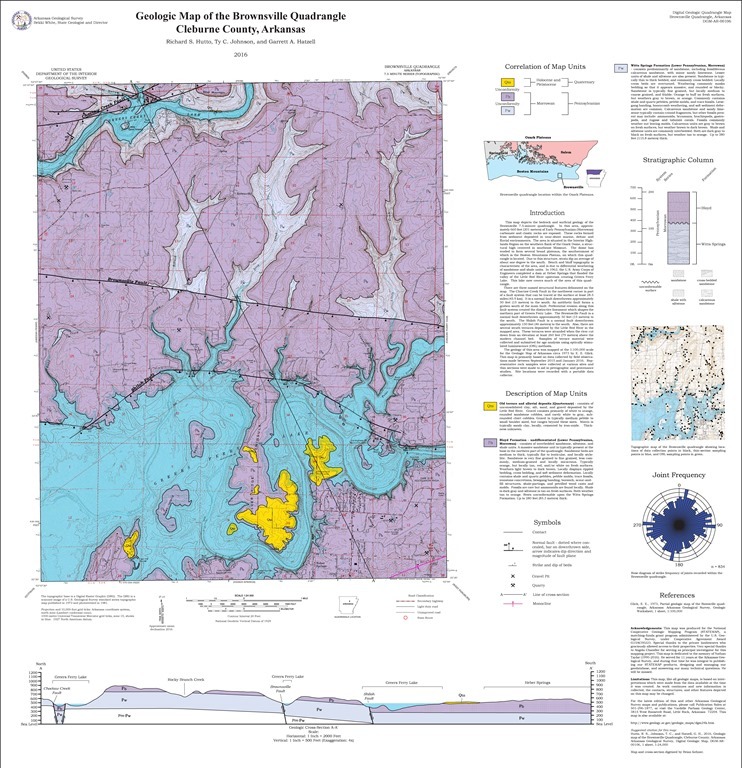 Previous work had been to produce the 1:500,000-scale Geologic Map of Arkansas. Because we mapped the Brownsville quad at the 1:24,000 scale, we were able to make some observations new to science. 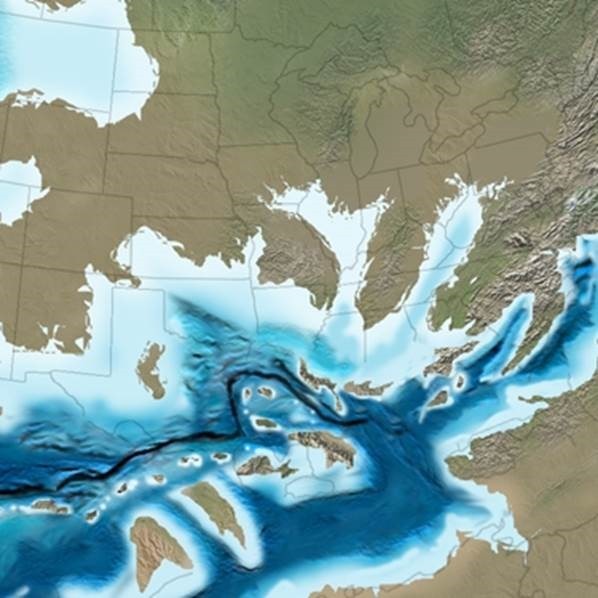 A fault was discovered that had never been mapped previously. We named it the Shiloh Fault for the old town, now inundated by the lake, that lies along its trace. Meanders of the Little Red River channel approached this fault but didn’t cross it, probably due to encountering more resistant rock on the north side of the fault. 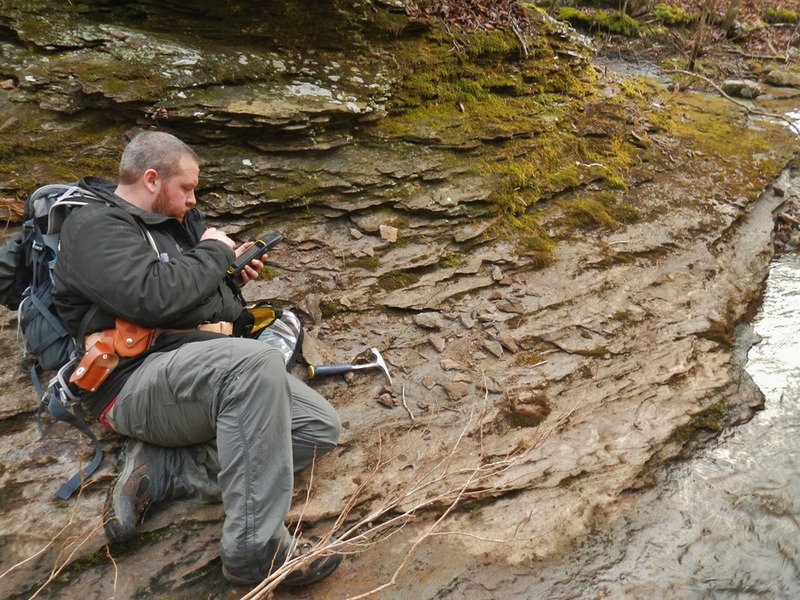 The Witts Springs Formation had not been mapped south of the Choctaw Creek Fault before, but we were able to draw in its upper contact with the Bloyd Formation along the Devil’s Fork and several other drainages. 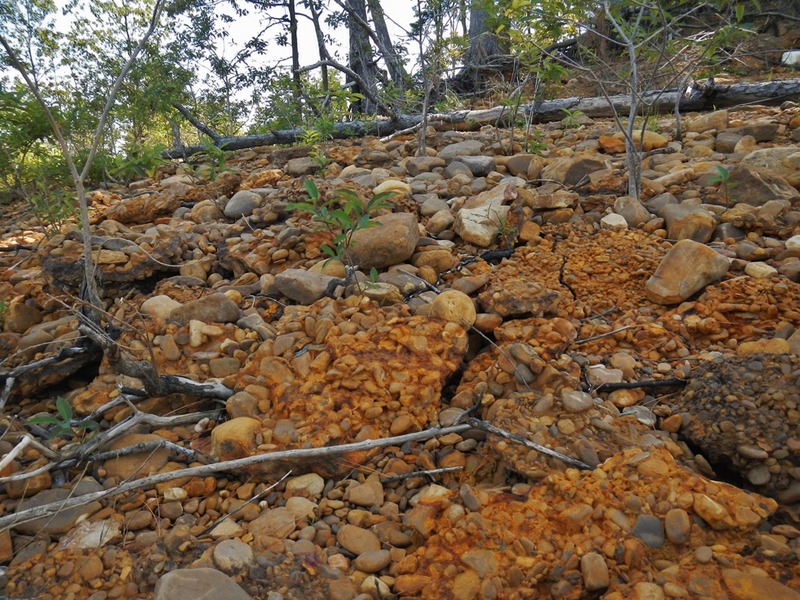 As on other quads around Greers Ferry Lake, we continued to find terrace deposits left behind as the Little Red River carved the valley down to its present elevation. Some of these are stranded as much as 260 feet above the current channel bottom (now located on the bottom of the lake). For many years now, our mapping program has focused on completing the Mountain View 1:100,000-scale quad. This area encompasses thirty-two 1:24,000-scale quads and stretches from Richland Creek to Sylamore Creek on the north side and from the Illinois Bayou to Greers Ferry Lake on the south side. Now that this area is finished, our Statemap Advisory Committee has decided we should jump over to northwest Arkansas to complete work on the Fly Gap Mountain quad, just west of the Mountain View quad (see map below). So for next year, the Statemap team is going to start work on the Durham quad in the northwest corner of the Fly Gap Mountain quad near Fayetteville. We’ll have to spend a few weeks getting our feet on the ground, so to speak, because we won’t have the benefit of already mapped quads adjacent. Fortunately, we will be very close to the type-sections for most of the formations we’ll be mapping, so hopefully, we can study the classic outcrops and trace them into our new field area without too much difficulty. A type-section is an area, or even just an outcrop, where a particular formation was first described. They are named after a local geographic feature. 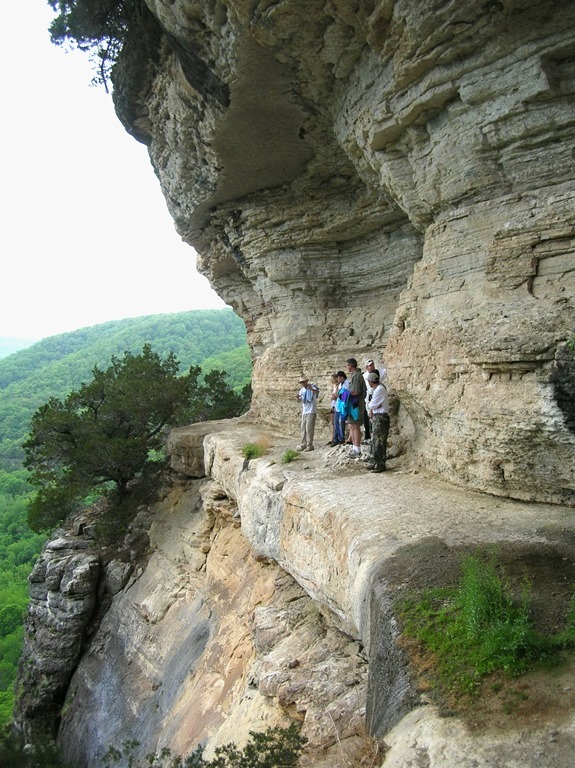 Formations first described in northwest Arkansas include: the Fayetteville Shale, the Pitkin Limestone, and the Hale Formation which has the Cane Hill and Prairie Grove as members. Members are smaller, discernable units within a formation. 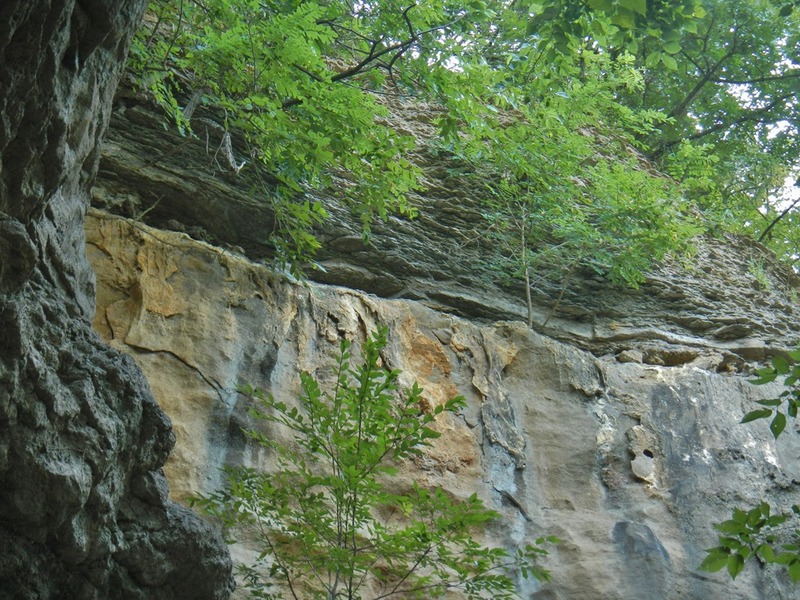 The type-section for the Bloyd Formation, including the Brentwood, Woolsey, Dye, and Kessler Members, and the Trace Creek, which is the basal member of the Atoka Formation (named for its type locality in Oklahoma), is on Bloyd Mountain near West Fork. I would like to take this opportunity to thank my field partners that accompanied me this past year. I started the year with Ty Johnson, who has since moved into a permanent staff position at the Survey, so congratulations to him! He was with me for just a year, but we covered a lot of ground together. He’s now mapping the geology of the Lake Ft. Smith area with an emphasis on landslide mitigation. The writer and also principle investigator of the Statemap grant, Angela Chandler, went out a few weeks in the late fall before we could fill the vacancy Ty left behind. No matter how much I learn, she always manages to teach me something new. We hired Garry Hatzell, a recent U of A grad, who started fieldwork in January. He brings an enthusiastic knowledge of paleontology to the mix, and I look forward to his continued insight into the biostratigraphy of our field areas. Without the help of these fine folks, we couldn’t have gathered the data or produced the map. Also, I would have been stuck in the office—a torture for the unrepentant field geologist. Wish us luck on the Durham quad! 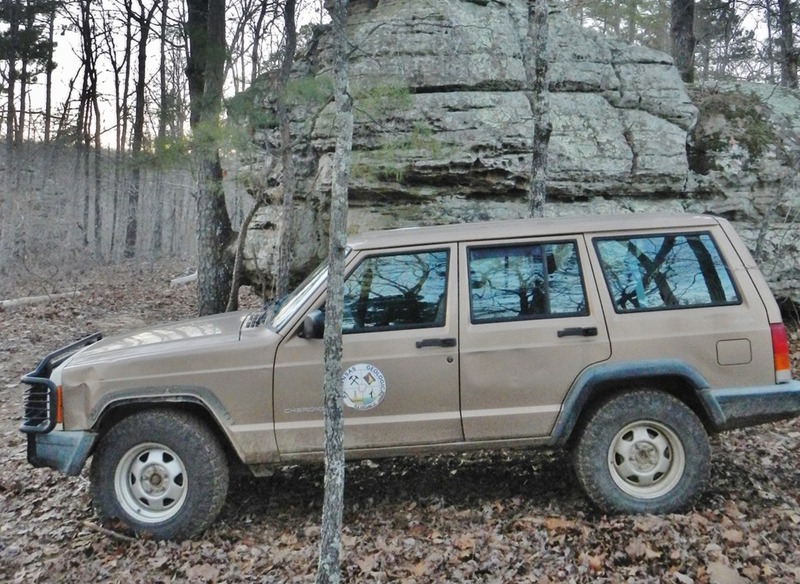 And if you’re in northwest Arkansas during the next twelve months and happen to drive by a Jeep Cherokee with the AGS seal on it, be sure to stop and introduce yourself. Until then, I’ll see you on the outcrop! This entry was posted in Notes From The Field and tagged Arkansas, Atoka Formation, Bloyd Formation, Brentwood Limestone, Brownsville, Choctaw Creek Fault, Devil's Fork, Durham, fault, Fly Gap Mountain quadrangle, Geologic Mapping, Geology, Greers Ferry Lake, Hale Formation, Little Red River, Mountain View quadrangle, Ozark Mountains, Ozark Plateaus, Parthenon Sandstone, Pennsylvanian, sandstone, sedimentary rock, Shiloh Fault, STATEMAP, strath terrace, type section, Witts Springs Formation on July 7, 2016 by argeology.